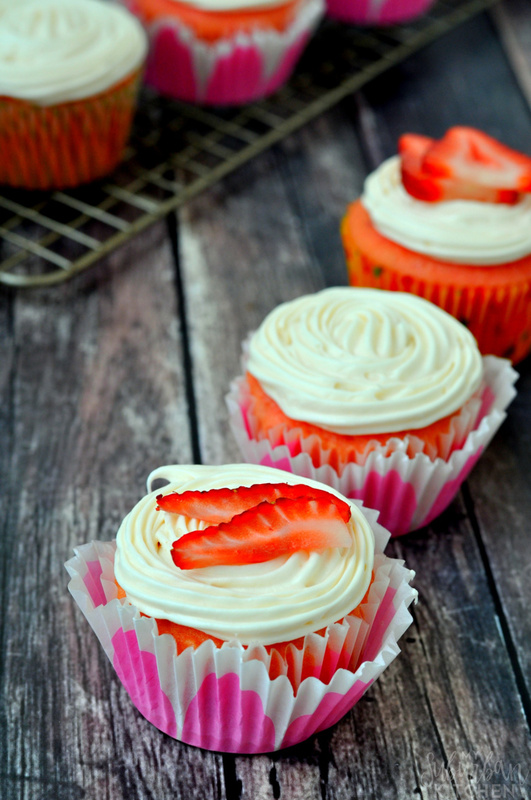 Strawberry Prosecco Cupcakes - A Delectable Pink Cupcake Recipe! 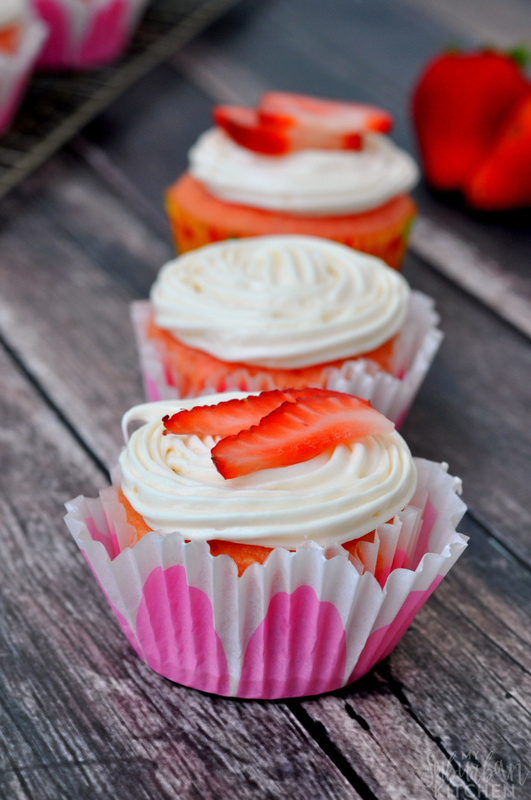 Strawberry Prosecco Cupcakes add a little bit of bubbly to your favorite cupcakes and make them extra special! These pink cupcakes are made from prosecco and strawberries, which make them the perfect sweet treat! Who doesn’t love adding a boozy twist to a classic recipe! You know what is better than cupcakes and bubbly? Bubbly IN your cupcakes…oh yeah, with a glass of bubbly too! 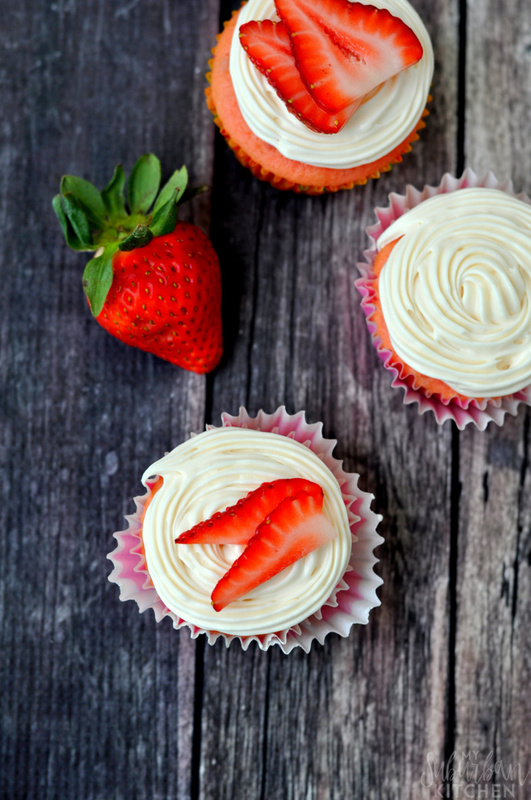 Strawberry prosecco cupcakes are the perfect dessert for Mother’s day, a bridal shower or any day where you want a sweet treat! With Mother’s Day coming up this weekend, I thought it was the perfect time re-share one of my favorite recipes that, quite honestly, looked almost inedible in their original photos. The original version of this recipe uses boxed cake mix so, if you want, feel free to go the easy route. I definitely won’t judge! Since then, I have gotten a little more confident in my baking skills so we’re baking from scratch this time around! Preheat oven to 350 degrees. Line muffin tin with paper cupcake liners. Set aside. Add strawberries to food processor and pulse until pureed. In the bowl of a mixer, mix eggs, strawberry puree, prosecco and oil until well combined. Working in batches, add in flour mixture. Beat on medium for 2 minutes. Fill each well of the prepared muffin tin about 2/3 full. Bake for 15-18 minutes or until a toothpick inserted in the center comes out clean. Let cool completely. For the frosting, bring 1 cup of prosecco to boil in a small saucepan over medium heat. Reduce heat to simmer and simmer for 15-20 minutes or until reduced to about 2 Tbsp. Beat butter in mixer until smooth. Working in small batches, add powdered sugar. With the mixer running, slowly add prosecco and beat until smooth. Frost cooled cupcakes. You could easily use your favorite sparkling wine in this recipe. If you go with something on the drier side, just know that they won’t be quite as sweet as this version. I top my frosted cupcakes with fresh strawberries for an added decoration. What are some of your favorite types of cupcakes? Have you tried adding wine to your baking?